The Network Age. Networking. Social tools. Six degrees of separation. Small worlds. Links. Nodes. Social networking. Social network analysis. Complexity and social networks. Value networks. Industry networks. These terms have crept into common usage in our business conversations but it’s difficult to see how they apply to the work we as individuals have to perform. If it’s a network, you can draw it. We’ll discuss the basic mechanics of identifying and characterizing networks. All networks have discernible purpose, structure, style, and value-producing properties. We’ll provide guide lines for designing and working with the different types of networks that occur within organizations and among extended organizations and partnerships. You can make sense of networks. We’ll look at some of the tools and techniques that are available to examine the relationships among people in a network. We’ll talk about how these tools can help diagnose critical problem and opportunity areas where purposeful reconfiguration can have the greatest impact. It always helps to have a map. The traditional map of an organization (the org chart) represents a hierarchical network view. We’ll look at alternate lenses that provide deeper insight into how work really gets done. The social networks. Drawing the relationships among staff who belong to a specific set of organizational units or who working on common projects or problems reveals how work really gets done (or doesn’t). Where does knowledge flow? Who is sought out for advice or expertise? Who controls the channels of communication? 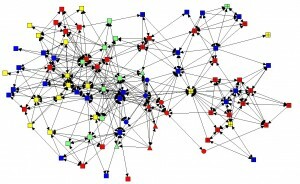 The value networks. The industry ecosystem in which an organization operates includes its stakeholders, partners, and competitors, who have their own interactions. Mapping the interconnections and the nature of the interactions and transactions in this ecosystem yields insights that prompt action to produce greater value to all. We are connected via the World Wide Web. If we are not “LinkedIn” or befriended on Facebook, we still participate in the vast ecosystem of relationships and interests indicated by web sites we visit and books we purchase. Generations X and Y enter the workforce expecting participatory intranets that provide bookmarks, RSS, microblogs, blogs, and wikis. A few simple rules. There are a small number of core technologies that have enabled the incredible richness of products for creating and managing social networks. We’ll summarize these and put them into a business context. Collaboration across boundaries is one of the most significant challenges for leaders in the 21st century. Collaboration is about working to make networks effective. Net Work – being intentional about creating and sustaining networks – is a core capability of successful leaders. Your personal network is key to your performance. Work performance and success is highly correlated with an individual’s ability to maintain a diverse network of contacts and to understand how to maintain and manage relationships. A simple exercise will reveal the diversity and reach of the participants’ personal networks and provide insight into how personal networks affect performance. You can’t manage a network. Many traditional “soft” management skills can refocus the role of management toward a model of stewardship. Stewardship is about creating the conditions in which vibrant and focused networks can make a difference for an organization and helping employees build net work skills. Using case examples from participants, we’ll work out some ways that the network perspective can leverage the power of emerging networks. Managing in Complexity. A complex system is one in which the relationships are always changing and in which there is absolutely no way to predict the future. We’ll tie together the network concepts, exercises, and cases by taking a practical view of how to lead effectively in an environment of continuous change. • Leave with a checklist of simple steps they can take immediately to begin improving their net work capacity. The workshop achieves its best results when customized to a particular organization’s context and desired set of outcomes; it is my pleasure to work with clients to customize this workshop to fit into their educational programs. Patti Anklam is an independent consultant who specializes in social networks and collaboration. She has been using social network analysis and related tools since 2000. Her book, Net Work: A Practical Guide to Creating and Sustaining Networks at Work and in the World, was published by Elsevier Butterworth Heinemann in 2007.